Firehawk Creative is a development partner that works with carefully selected, early stage startups and entrepreneurs to bring their ideas to life. Our development process is carefully constructed to transform an idea through wireframes and storyboards to a fully functioning and polished product. We completely focus our resources to one product at a time to ensure that we are providing our partners with the ultimate experience. 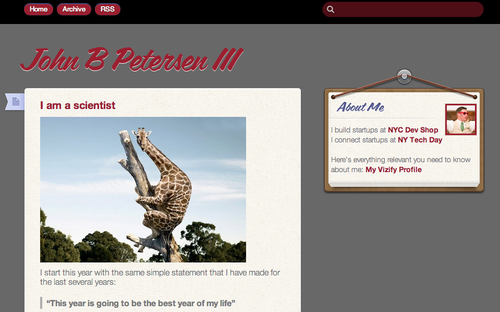 I am going to use jbp3.com as my own personal Minimum Viable Product. It is an exercise to improve my design and development skills and to do some fun things I’ve had in my head for a while. It is going to be a slow process, but it will keep me entertained for now. The new redesign is a weak first step — I couldn’t stand that old design, so I just used a very basic Tumblr theme and then customized the HTML as much as possible within reason. There’s still a few ugly things I will be changing soon. This site is going to be my nerd-hobby. As always, looking forward to hearing your thoughts and feedback. "Using Technology to Enable Dreaming"
I know. I’ve heard all the stories. I’ve heard all the gloom and doom. The economy, unemployment, global warming, energy crisis. There are certainly plenty of reasons to be fearful of what the future will bring. But I’m excited. Much more excited than I’m afraid. Maybe it’s the entrepreneur in me. Maybe it’s my belief that everything happens for a reason. Or that everything will work itself out. Whatever the reason, I think the future is bright for our children and their children. And it’s things like this video that reinforce my beliefs.